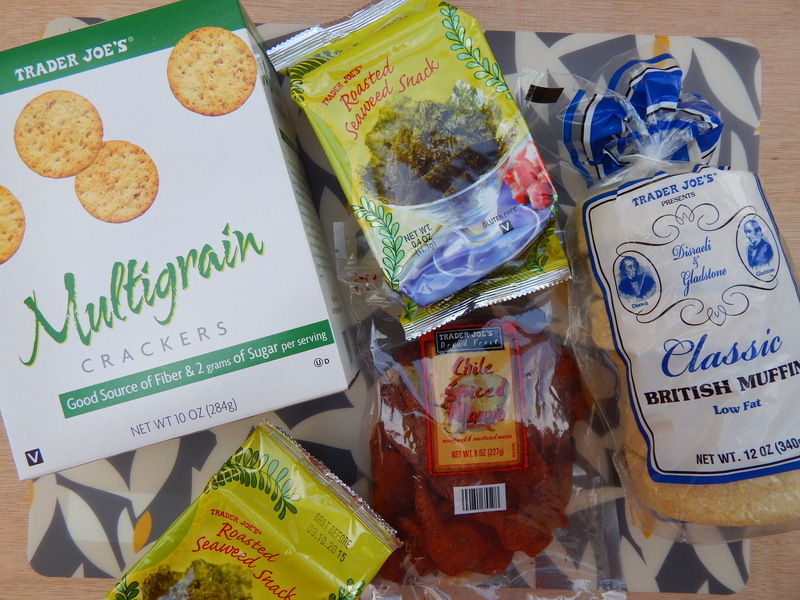 Take a look at what I bought at Trader Joe’s this visit. I managed to escape without anything pumpkin flavored or pumpkin spiced! I love the fall, but I’m just gonna say it… I am not a fan of everything pumpkin. Don’t hate me. If you love pumpkin items, go visit Trader Joe’s. You will be so happy, and you will love me forever for telling you! Here’s what I did pick up. Above are my snack items. The British Muffins (not English muffins lol) I will use them to make my husband breakfast sandwiches. I like them toasted with a little butter alongside oatmeal. I got our favorite salty seaweed snacks. This time I tried their dried chile mango, and I really liked it. Lastly for snacks I got multigrain crackers. These little crackers are awesome! I enjoyed them with the hummus I have below. They have a good flavor and buttery texture. They remind me of a healthier Ritz Cracker. 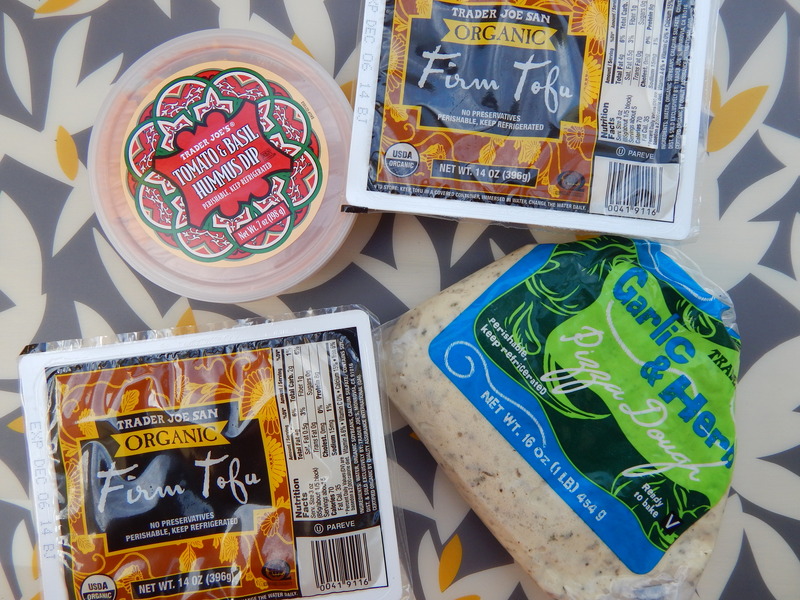 For the refrigerated items I got my favorite tofu and a new pizza dough to try out. I also decided to try their Tomato & Basil Hummus Dip, and I am sooooo glad I did! I am not even a big fan of tomatoes, but this hummus was delicious. It has a milder flavor that traditional hummus, and it is a little lower in fat too. My youngest sister was with me on this little grocery trip. She is only 14, but she is very interested in eating healthy, cooking and buying natural products. So cute! These are the two items she wanted to pick up. 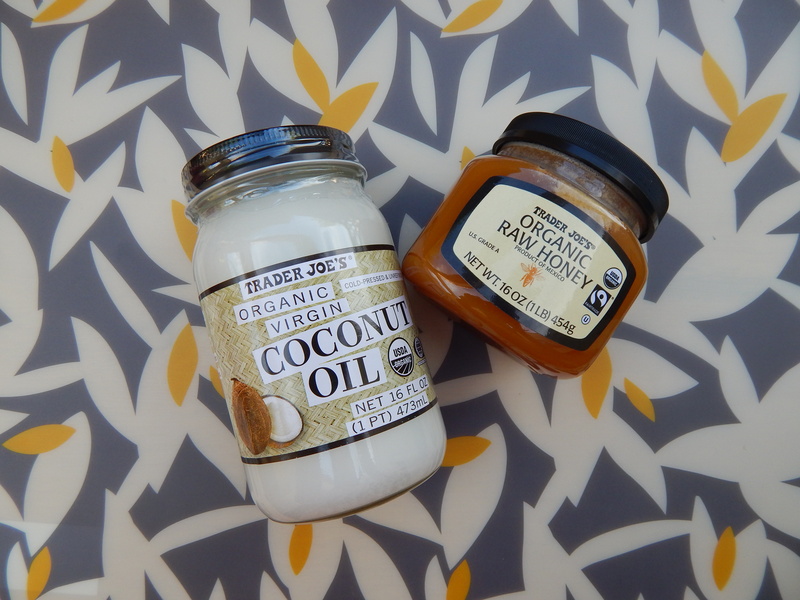 Organic Raw Honey which is good in a hot tea or if you have a sore throat and… THE AWESOME Trader Joe’s Organic Virgin Coconut Oil. So many uses for that! I only picked up a couple of produce items, as usual. I buy most of my produce at Sam’s Club, Costco or other stores. 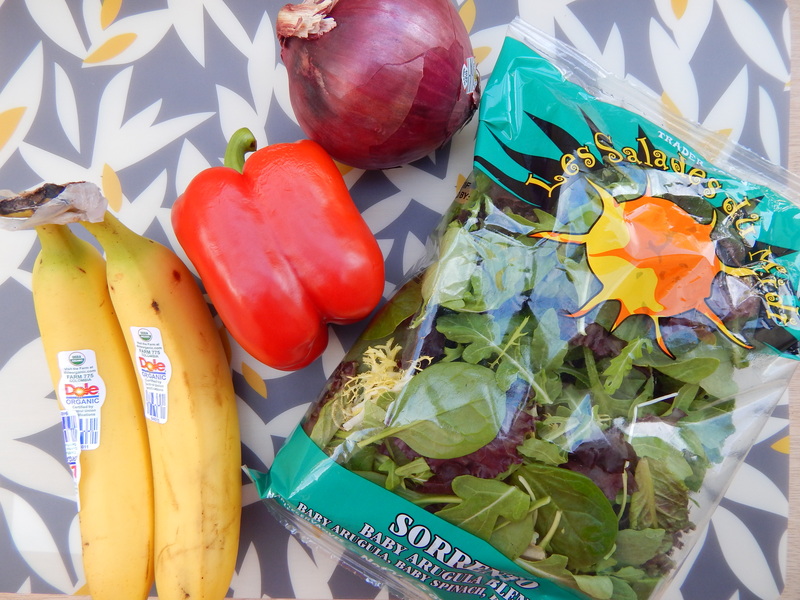 I got a couple of bananas, a red onion, a red bell pepper and some salad mix. They have a nice assortment of salad mix. I plan on making a fall inspired salad with the Sorrento Mix. 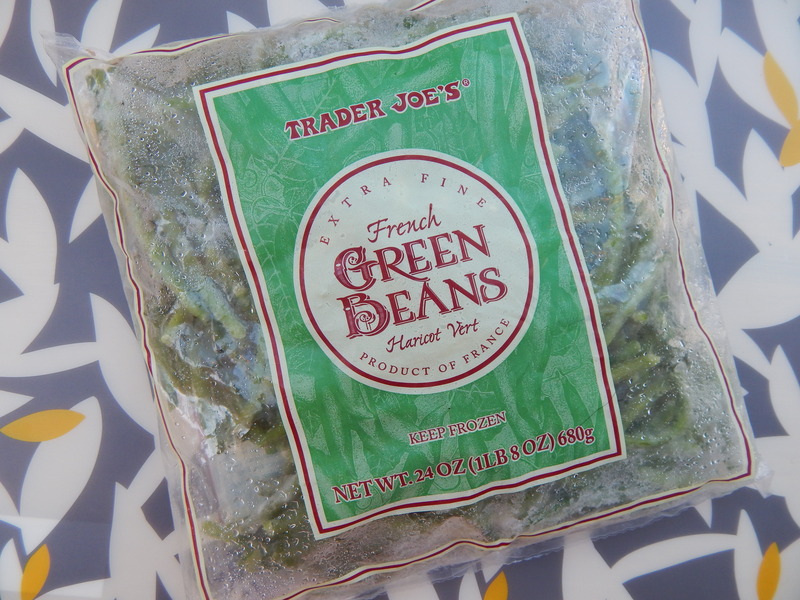 In the frozen isle, I found these fancy Hericot Vert aka French Green Beans. This huge bag was a great deal at only $1.99. Lastly, I picked up some pantry items. 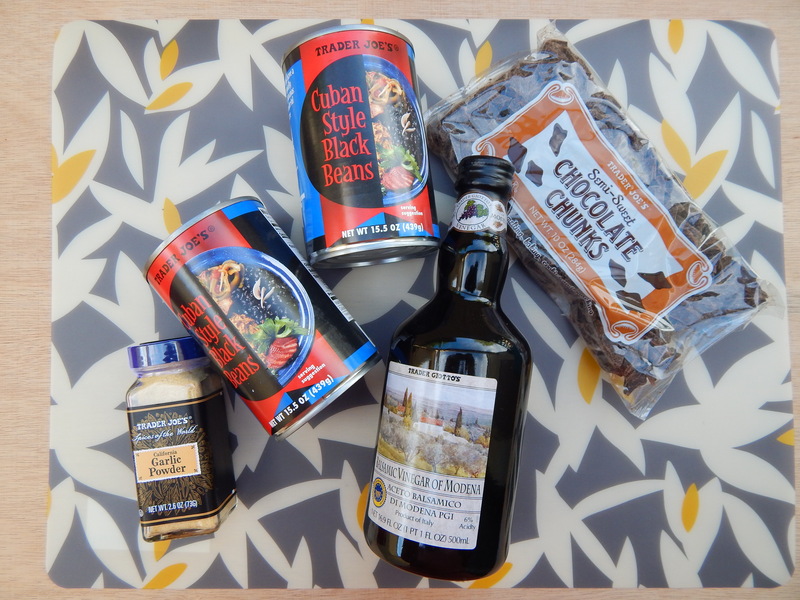 Garlic powder, balsamic vinegar, chocolate chunks for baking and Cuban Style Black Beans. I plan on making a balsamic vinaigrette for my salad, so I am excited about that. I liked the Cuban Style Black Beans, but they didn’t have as much flavor as I expected. The garlic powder was great and very strong. I will slowly start buying more spices at Trader Joe’s. They have good prices and are high quality. That’s all for this trip!